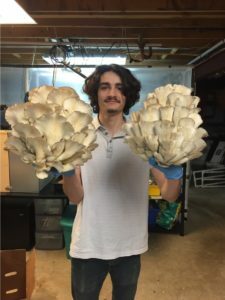 Passionate about the world of fungi, Etienne Leblanc will be sharing his learning journey through mycology and starting a profitable mushroom business. This presentation will feature hands on learning of basic mycology, with participation available! Spores, mycelium culture, cloning of species, grain transfers, and of course how to grow from spore to fruit will be presented. If you would like to grow your own gourmet mushrooms at home, you will not want to miss this! Hi everyone my name is Etienne Leblanc, I was born in Canada on March 30th 1995. I first started learning about mycology when I saw these beautiful pink oyster mushrooms, I just had to learn how to grow them! In June of 2016 I decided to learn to grow mushrooms from spores to fruits, as it was a unique and fun process I fell In Love with. I began practicing for my own culinary purposes, but came to find growing mushroom had become a passion and I needed to share it with the world. In March of 2018 I felt comfortable enough with my skills to start a business, with the help of my father. We engineered a fruiting chamber in order to bring the best quality from our mushrooms. I started growing a variety of mushrooms including; a different species of oyster mushrooms, shiitake and lion’s mane. Once we had consistent inventory, i began contacting local restaurants and businesses, and made a ton of wonderful connections with chefs and owners. I am enjoying the world of fungi so much and am very eager to learn, teach, and discover more!